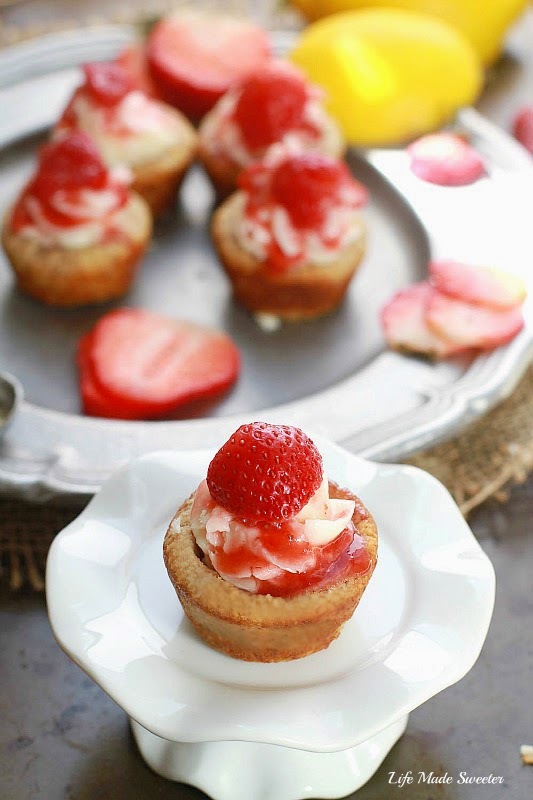 These adorable mini cookie cups are made with an almond flour cookie crust, filled with coconut whipped cream and topped with a homemade strawberry lemon compote. They are vegan, gluten free and dairy free. Easter is just around the corner and as much as I adore serving classic layered cakes, I always bring along a varied assortment of portable desserts as well whenever we have a large family gathering. A few of my family members have various food allergies and sensitivities so I always have to keep those in mind whenever I’m in charge of dessert. I love replacing all purpose flour with various gluten free flours whenever I can. I also usually keep Bob’s Red Mill Almond Meal/Flour on hand for making macarons because it always produces excellent results but lately I’ve been using it in a lot more different ways. 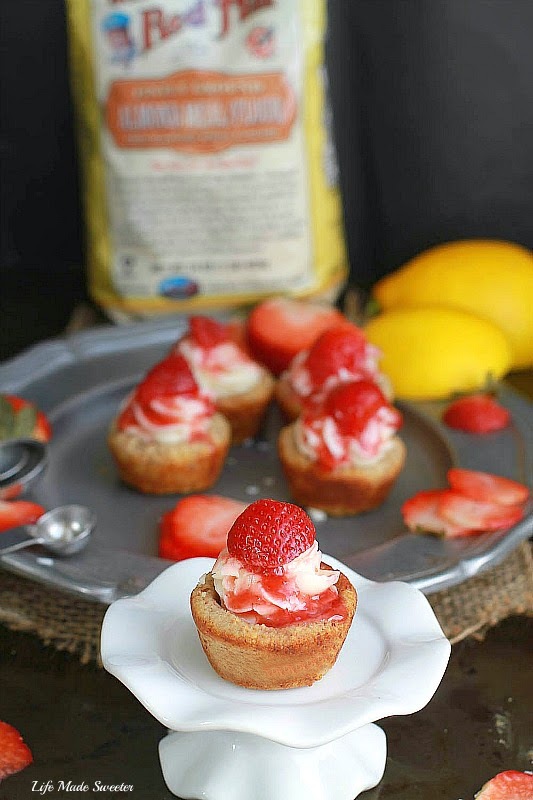 You won’t be able to tell by tasting these delectable little bites but these mini strawberry lemon cookie cups are gluten free, dairy free and vegan. The gluten free cookie base is made with almond flour which I find not only helps give it that soft and chewy texture but it also adds a nice and subtle nutty flavor. The cookie cups were made in a mini muffin tin since mini desserts are always so much cuter and more fun to eat. In order to keep them vegan, I replaced the egg with a flax egg but feel free to use a conventional egg at room temperature if you prefer. They’re filled with a dairy free coconut whipped cream and topped with a spoonful of homemade strawberry / lemon compote. These cookie cups will make an elegant and adorable sweet treat to serve at your Easter celebration or for any other spring or summer dessert table! 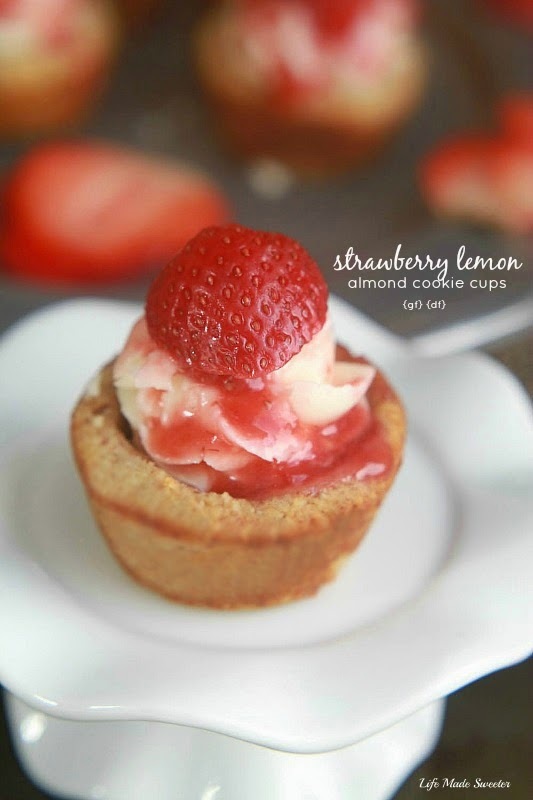 These delicious and adorable cookie cups are made with an almond flour crust, filled with coconut whipped cream and topped with a homemade strawberry lemon compote. They are vegan, gluten free and dairy free. To make the crust: Preheat oven to 335 degrees. In a small bowl, make flax egg by stirring together flaxseeds and water. Set aside for a few minutes and allow to set and thicken. If coconut oil is solid, melt in microwave in 10 second increments. Whisk in sugar until combined. Add vanilla extract and flax egg (or large egg) and whisk until combined well. 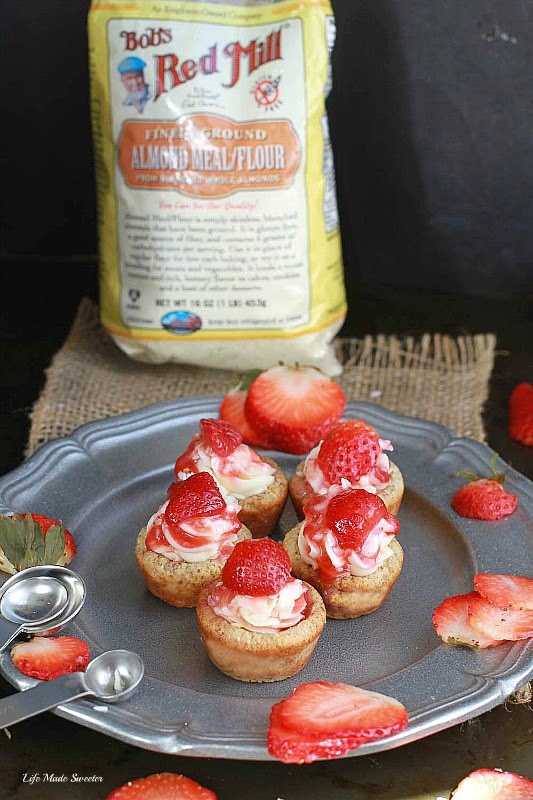 Sift almond flour directly into mixture and stir together until just combined. Roll into 1 tablespoon sized balls and press dough firmly down with fingers to mold into muffin tin. Bake for 11-13 minutes or until golden, rotating pan halfway through and pushing the dough down in the middle with the back of a small spoon. (*Note - almond flour browns a lot quicker than all purpose flour so be sure to keep on eye on them regularly after 10 minutes). Remove from oven and allow to cool completely in the pan. Meanwhile, make the coconut whipped cream: Place a large mixing bowl in the freezer for 5 minutes to chill. **Take the can of chilled coconut milk and turn it upside down. Open the can and pour out the liquid (or you can reserve that to use in smoothies). Scoop the hardened coconut cream into the chilled mixing bowl. Using a hand mixer, whip the cream for about 30 seconds. Then add vanilla and powdered sugar and mix until creamy and smooth - about another minute or two. Cover bowl and place in fridge to chill and harden. Meanwhile prepare the strawberry lemon compote: In a medium saucepan combine strawberries, sugar, lemon zest, lemon juice, water and cornstarch. Cook over medium heat and using a wooden spoon stir constantly until the mixture boils. Lower heat and simmer gently until thick enough to coat the back of the spoon, about 3 minutes. Remove from heat and thin sauce with water if it is too thick for your liking. Allow to cool. When ready to serve, remove coconut whipped cream from fridge and place in a piping bag with a star nozzle. Pipe into each cookie cup and add a small spoonful of strawberry lemon compote. Garnish with freshly sliced strawberries if desired. This post is sponsored in partnership with Bob’s Red Mill. Thank you for supporting the brands and companies I value. For more delicious recipes and a coupon for $1.00 off any product, please visit BobsRedMill.com!